Steven L. was working on the roof when he fell headfirst through an acrylic plastic skylight. He landed 35 feet below on a concrete floor. His back, some ribs and his left arm were broken; and a lung was punctured; eventually his broken right leg was amputated. 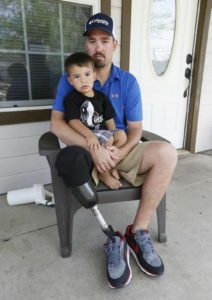 As a single dad of 4, Steve struggles to support his family and keep up with his kids using the basic prosthesis covered by Workers’ Compensation. On top of the energy he needs to raise his family, he’s still working as a third shift laborer. HAF and Baker Prosthetics & Orthotics teamed up to provide Steve with the “high activity” leg that he needed. With his new lighter equipment, he’s more capable of hiking, playing softball, and participating in all of the activities that his kids want him to participate in with them.